Home » Reading » When you can hear an author read their work, go! I went to a real life book tour! This opportunity doesn’t arise very often where I live, especially for books and authors that I’m interested in. As you probably know, listening to an audiobook narrated by the person who wrote it always makes the experience of the book even cooler. Now, imagine hearing a book read live by the author, who is standing five feet in front of you. And, they’re even handing out free cupcakes too! 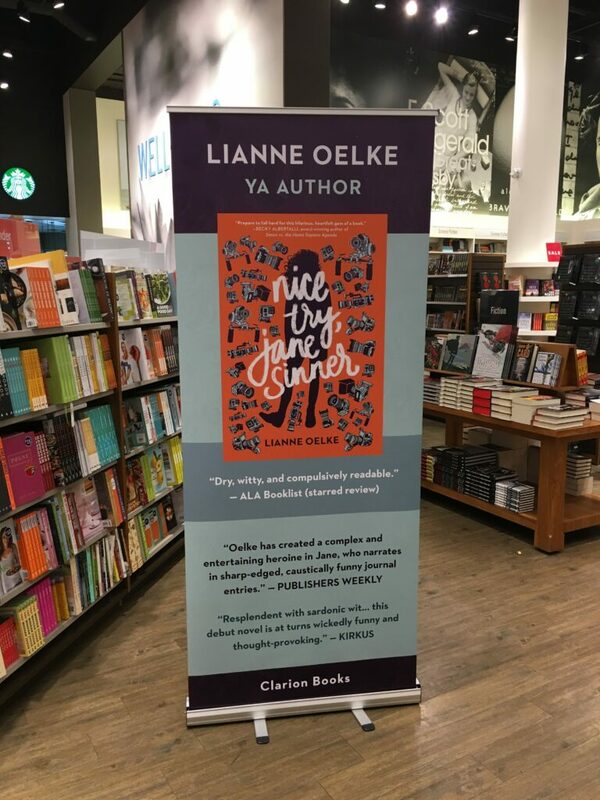 That, my friends, is what happened at the Nice Try, Jane Sinner book tour here in Calgary on January 20, 2018. The lovely Lianne Oelke came back to her hometown (and the city where Jane Sinner takes place) to celebrate the release of her book with her family. Nice Try, Jane Sinner has been out in the world for two whole weeks. I had the privilege of reading Nice Try, Jane Sinner early and the chance to participate in a blog tour leading up to its release. Read my review and interview with Lianne, then check out the other stops on the tour. I made sure to buy a gorgeous hardcover copy of the book and even got it signed. It was so nice to meet Lianne in person after emailing and interacting on Twitter. Stay tuned to my Instagram for some more photos of this gorgeous book. If you haven’t read the book yet, go do it! It’s Canadian fiction, set in Calgary, about a teen girl who joins a community college reality t.v. show to try and win a car (and her independence). It explores things like mental health, personal identity, friendship, trust, faith, and family. In case you’re not sure where to go for the book tour stop, look for large pull-up banners. Author Lianne Oelke and friends reading a scene from Nice Try, Jane Sinner. Copies of Nice Try, Jane Sinner waiting to be signed. Yum! The cupcakes were delicious. The decor was so pretty! Lianne Oelke greeting a friend and signing a book for her. 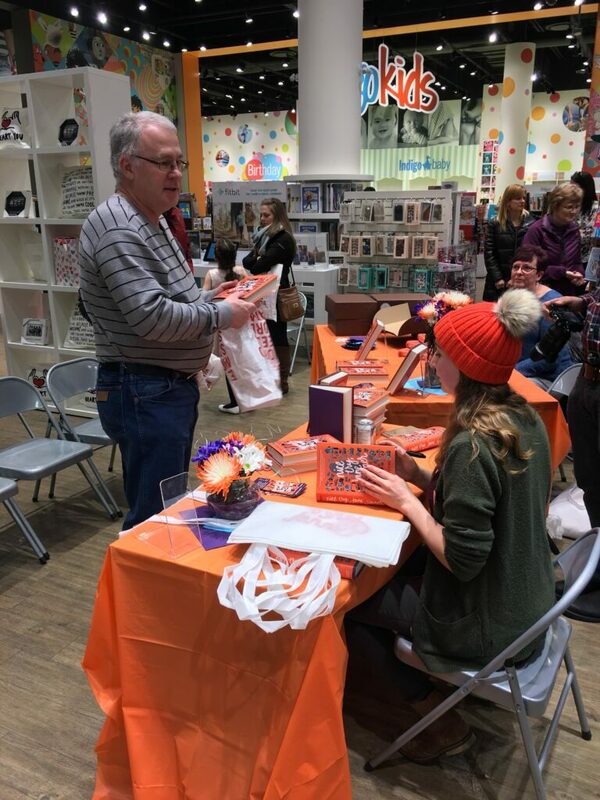 A gentleman (possibly Leanne’s dad) buying two books to get signed! Family members who buy your books are the best. Now, are you going to go buy and read Nice Try, Jane Sinner? I hope so! I totally agree. Even if you’ve never read their books (or only one or two), Book signings and author discussions are the best. I’m lucky and had the opportunity to meet some cool authors (James Dashner, Marissa Meyer, Kiera Cass, Richelle Mead, etc.). I had the chance to go to a Maggie Stiefvater signing but didn’t go because I hadn’t read any of her books yet. Totally regret it. That signing looks amazing! Sounds like fun. Totally checking out that book. I love seeing the photos from the event!